J - Jesus has no sin. E - Excited that He is coming back. S - Since he loves us he gave His life for us. U - Unbelievable creator of the earth. S - Shocking that someone with no sin would give his life for us. I know that Matthew loves Jesus with all that is within him, but this acrostic touched me so deeply. A few months ago Matthew and I were riding down the road when he says to me, "Mommy, I don't fit here." I was curious as to where exactly "here" was. As I dug a little deeper, he explained "Mommy, I'm different. I think different from most kids my age and I just can't find a place where I fit. I think God might be calling me to do something different. I'm not sure if it is missions or something else, but I just don't fit here and I'm ok with that." The last part of that sentence brought me great comfort, he was ok with being different. We encourage different from what the world considers normal. Even though I had great comfort in the last part of that sentence the first part caused the apron strings to want to tighten for life. Missions...really? What a calling? What a ministry? What an honor? Not my children, God. And God said..."Whose children?" My heavenly Father reminded me that these precious children do not belong to me. I am merely the steward. My children belong to God and He created them for His purposes and for His glory. He has entrusted these children to me for a short time. He has asked me to encourage, train, discipline, disciple, rebuke, correct and love these children for His glory. Will I be faithful to the calling? Will I let them go when my children say, "Here am I send me? "3 John 1:4 NIV I have no greater joy than to hear that my children are walking in the truth. I know he is only 10, but if God is already stirring within the heart of my 10 year old that he is called to something different, then as a faithful steward I want to do all I can to prepare him for that day. Matthew is right. He is different. He does not fit here. And I rejoice in that. We are called to be different. 2 Corinthians 6:17 NIV "Therefore come out from them and be separate, says the Lord. I pray that God will continue to make my children different. I pray that they would stand out and that they would be separate. I pray that they will bring God glory in all they do and obey His calling on their lives. I know that the day will come when I will have to completely let them go so that they can fulfill God's calling on their lives. Am I ready for that day? I am preparing and praying even now. I am praying that God will continue this wonderful work he has begun in Matthew's heart and life and that whatever the call, he will obey. How about us...will we obey? I want to be different. I don't want to fit in this world. I want to be separate. All for His glory. We have 4 little boys and have never had a broken bone. Broken candles, broken toys, broken light bulbs we have had but no one has ever broken a bone. We have been to the ER for a couple of x-rays anticipating a broken bone, but they were always intact. I always knew if anyone was going to break a bone it would be Jacob. After all he is the 4th brother, always the bottom of the dog pile, climbing on counter tops, falling out of windows, jumping off of furniture, I even found him standing on the top (yes the very top) of our van in the driveway. We have survived all of this without a break until Thursday night. Jacob was riding piggy back on Caleb as they were running down the hall being chased by Joshua. This game did not end well as once again Jacob found himself at the bottom of the heap, but with his elbow twisted in such a way that it defied the skeletal system and gave into the unnatural pressure. He cried and cried, but nothing looked broken. We honestly thought he was suffering from nurse maid's elbow so he slept on it, but when he woke up the next morning with the same pain he fell asleep with, I knew it was time to seek out a radiologist. After a few tests by the Dr and an x-ray, they confirmed that it was broken. I confess, I cried. The thought of my baby being in pain was heartbreaking, but I was also very nervous as to how we would survive a 3 year old wearing a cast. After all, his favorite activity is taking a bath. As I watched that adorable little blonde head sitting very still as he cut his big brown eyes from side to side so as not to move even the smallest muscle I began to think that maybe he was embracing this place. I was right. He loves his cast. He is so proud and he is so careful. He is embracing this time in his life. "I do it mommy. I can!" This broken bone has not stopped him. He reminds us to wrap it really good before his bath and he holds it out of the tub just in case. I have been amazed at such a young age how he is truly embracing this place of brokenness. What an example and an encouragement to us as believers? Do we embrace those broken places in our lives? I don't know about you, but I often want sympathy. I want to milk it for all its worth. I want to feel sorry for myself. I confess, I don't always embrace the broken places in my life. 2 Corinthians 12:9 NIV But he said to me, "My grace is sufficient for you, for my power is made perfect in weakness." Therefore I will boast all the more gladly about my weaknesses, so that Christ's power may rest on me. I want to rejoice in my brokenness. I want to rejoice in my weakness so that Christ power may rest on me. "Rest" on me, to fall upon me and camp out there. I want to have Christ power carrying me through and his power being made perfect through my weaknesses and broken places. His grace is sufficient. We have to embrace it. We have to boast in what Christ will do as a result of those broken places. Thank you Jacob for reminding me to "embrace those broken places." "What Does Your Cantaloupe Say? My parents have been married for 40 years. Not just married, but happily, totally in love married for 40 years. Growing up I never really gave much thought as to why. Why?...because that's just how married couple are. I lived in a world that ALL marriages were that happy, that loving and that Godly. I entered my marriage with those same expectations and I am overjoyed to report that for the most part it has been abundantly more than I could ask or imagine. What I have learned is that it takes work. I never really saw my parents work on it. I just thought that was the way it was. What I now know is that they worked on it and they worked hard, but the natural overflow with which they worked made it appear so easy, that it was just part of life. Tonight I was having dinner with my parents and I noticed something was written on their cantaloupe in the fruit bowl of the breakfast nook. I looked closely and in a handwriting that will forever be engraved in my memory I saw these three words I LOVE YOU and a heart with an arrow. I quickly realized what Daddy had done. 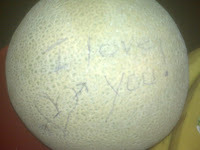 He left this message on the cantaloupe for mother to find in the morning. As strange as it may seem, having a message written in fruit did not seem odd to me. We grew up with messages written in lipstick on the mirror, dry erase markers on the windshields, notes in Bibles or briefcases, notes taped to the door or steering wheel, notes written on lunchbox napkins and messages written in the fog on the mirror after a hot shower. We have even returned home to find stuffed animals holding notes that "they" wrote stating.."Monica, you might want to clean your room. Your mom is starting to get upset. Love, Teddy" They have been doing this for each other for as long as I can remember. Growing up my brother and I even grabbed hold of this love language and began to leave notes for them and for each other. I once intercepted the Sports Illustrated Swimsuit Edition and cut out clothes from the JCPenny's catalog and glued them on all the girls and left my brother a sweet note about how much I cared about him and wanted to protect him from temptation. I'm sure he appreciated it, even though he would never have admitted it as he peeled each outfit off to find that the glue has ruined the magazine. OOPS!! Anyway, what was actually working on marriage for my parents became just a part of who we were as a family. They found a love language they could speak and one that was received. Now don't get me wrong, they did other things too, like serving each other, planning sweet dates and trips, they communicated well and they made their relationship a priority among all the other demands that pulled at them. I can say I have been blessed to have such a Godly example of a marriage that brought Him glory and honor. The good news for all of us is that we can have that same marriage. We can have a marriage that after 40 years can still get giddy and creatively sneaky to write a love note on a cantaloupe. Marriage is work no matter your status. 2,4,10,25,40 years, it does not matter, marriage is work. Marriage is daily dying to self and asking God how we can minister to our spouse. Be creative!! Think outside of the box. Let them know you care. What Does Your Cantaloupe Say? "I'm So Glad My Family Has No Feeling"
We joke around with our kids a lot. I mean a whole lot. You know like, "Hey mom I'm thirsty." "Well, son take this cup and go fill it up with some water from the toilet because it has way too much water in it right not." Gross? No!! We have fun. We tease, we joke, we play, we mess around all the time. As a result my children all have really great sense of humors. We have however had to encourage them to be careful as they try and joke with others. Sometimes it can come across disrespectful or inappropriate if the other person does not realize it is a joke. The other night Matthew and I were cleaning the kitchen after dinner and he said something, that I can't recall at the moment and I said, "Ha, Ha." Matthew hugged me and said, "I love our family. I'm so glad my family has no feelings." I started laughing hysterically. "Wow, Matthew say what's on your mind buddy." He laughed too and said, "Mom, you know what I mean. I'm glad our family is not sensitive and we can have fun together." I did know what he meant and I am thankful for the same thing. Just the other day I had said to a friend that I totally understand why God did not give me any little girls. Little girls are sensitive. They cry easy. They get there feelings hurt easily. 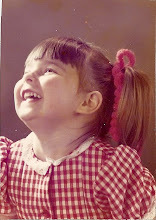 Maybe not all little girls for those of you who feel like I am stepping on your little princess, but I was a little girl myself and I was sensitive. What I have noticed is that you don't have to be a little girl to be sensitive. There are lots of sensitive people in this world. As a matter of fact a good test for if you are sensitive or not might be, if in your mind you are saying, "Do you think she is referring to me?" Then chances are...I'm just saying. Now don't get me wrong, there is a certain kind of sensitivity that is good. Being sensitive to the feelings of other, being sensitive to the leading of the Holy Spirit, being sensitive to the needs of those around you are all wonderful sensitivity traits. The kind of sensitivity I am talking about is one that for many years had its ugly grip on me. It was an ungodly sensitivity. It was a paralyzing sensitivity. "Are they talking about me? What did they mean when they said that? I can't believe they said that to me? I thought they were joking, but do they really believe that? How dare they?" Now I realize the Bible addresses coarse joking, but I am not referring to joking that is or in any way could be considered hateful or discouraging. I am talking about good old fashioned picking!! Actually, the real heart of the matter I want to address has very little to do with the actual "picking" aspect at all and everything to do with turning over our sensitivity to God, letting go of those insecurities that rob us daily of our joy and paralyze us, causing us to believe the lie Satan whispers in our ears. God has called us to be a confident people. Confidence mind you that is found in His Word, His Will and in an intimate relationship with Him. The more we know who we are in Him, the less we care who we are to the world. Imagine with me if you will how allowing our hearts to grasps this concept could very practically change our relationships with our spouse, our children, our friends and our work relationships. Imagine if we walked so closely with our Savior and found our identity in Him that our earthly feelings were never hurt. How is that possible? Hebrew 12:14 "Make every effort to live in peace with all men and to be holy; without holiness no one will see the Lord." Proverbs 19:11 "A man's wisdom gives him patience; it is to his glory to overlook an offense." I actually have Proverbs 19:11 on my refrigerator. Do you know why? Because every day I struggle with my flesh wanting to have its feelings hurt, but the Spirit of God rising up within me and saying..."A man's wisdom gives him patience, it is to his glory to overlook an offense." And do you know what? Before I can ever be hurt, before I can ever hold a grudge or throw a pity party I seek wisdom. Wisdom is found in the Word of God. He is the author of wisdom. Wow, how freeing to live being able to give it to him daily and not carry around the hurt. If I cried every time I didn't get my way, every time I someone called my idea stupid, every time I dropped my ice cream on the ground or every time someone spoke to me in a way that I felt was intended to hurt my feelings, I would ball up into the fetal position and start chattering a chant as I prayed for a protective covering to encase me and shield me from this world. The good news is "under His wings shall I hide and take refuge." He is my protective covering. Not necessarily from experiencing the hurt or the "attacks" but by giving me the wisdom through His Word to know how to handle them and to know that He is all that matters. That's the bottom line. When Jesus becomes all that we need (He is by the way) and He becomes the only one we are seeking to please, then we are released from being sensitive to the things of this world. I will close with this...Matthew's class has had some problems with bullies this year. They pick on whoever will be shaken. I asked Matthew if they picked on him and he said, "yes ma'am but it does not bother me." I was curious as to why he was not bothered, "When I wear a blue shirt they call me a big blueberry. When I wear a red shirt, they call me a big strawberry. I know I am not a blueberry and I am not a strawberry. I am the son of the Most High God. I don't really care what they think." He gets it. He is confident in who He is in Christ. He has found His wisdom in the truth of scripture and on that truth He can stand. I agree with Matthew..."I'm so glad my family has no feelings." Standing firm on the promises of God!! I had the privilege of speaking to a precious group of ladies this weekend. God's presence was truly felt and He worked in all of our hearts. While I was away, my amazing husband did all the laundry and my sweet boys put it all away. This was such an extra blessing. I walked in the door and was greeted by lots of hugs and kisses and cheers for "Mommy." I did notice however that their seemed to be a whine about the house, led by my precious little Jacob. You know the bit, "Moooommmmyyyyy, can I pleeeeaaaase have taaaannnng." Everything he said was in a sing song whine. I was so happy to be with my children and to hear their precious voices, but the whine...oh my word. I was exhausted from such an awesome weekend, but the whining led the exhaustion to seek out a very early bedtime for one and all. There was really no reason for Jacob to whine. I was home. I was excited to see him and I would have done anything he asked as long as it lined up with the Hawkins House Rules. He knew that and he was asking, but with a whine that told me he didn't believe I would do what he was asking me to do. Tonight the Lord brought a situation to my attention that took me to a passage of scripture that convicts me and that I pray will not be the case for us as believers today. This group of believers had gathered at the home of Mary the mother of John and were praying and believing God for the release of Peter from prison. They were interceding, trusting, pleading, asking God to protect and release their friend. Even as they prayed God was doing exactly what they were asking Him to do, but guess what. They did not have the faith to believe what they were asking. The answer to their prayer walked in the door and still they said "You're our of your mind." I read this and I totally don't get it. How could they spend the time and the energy praying for something all the while not believing their prayers would be answered. It seems like such a tragedy, but what breaks my heart the most is the fact that we as a church (the universal body of Christ) do this everyday. How often do we sound like Jacob? Do you ever wonder if Jesus would like to serve us a little cheese to go along with the whine? Don't misinterpret what I am saying. I know that He wants to hear from us. I know He wants us to be in a constant conversation with Him and bring everything to Him, but do you ever think asking while not truly believing in faith that He will do what He says He will do, just comes across as whining. I want to know that when I go before my all-powerful, all-knowing, loving Father, that I am doing so with the Faith that He can and He will answer. I want mountain moving faith. I want to possess mustard seed faith. What are you trusting God to do today? What are you interceding and asking of your Savior today? Is it according to His will? Do you believe He can do it? Watch, be alert expectantly waiting for Him to answer. Ask in confidence, but not a confidence of your own, but a confidence in our God who is able to raise the dead, part the seas and break down walls so we can possess the land. Dear God, may we possess the faith of a mustard seed and say to this mountain...be moved. I am praying for a mountain to be moved today! Join me as we wait with great expectation. May we pray with boldness and faith so Jesus will never have to ask us... "Would you like some cheese with that whine?"